Manshead Highly Commended at SDC. As I mentioned in my previous post, last week was a big week at Kempt, it featured top 10 apps, conference attendance, public speaking slots (Alex at the Fantastic Tavern) and a hell of a lot of Red Bull! 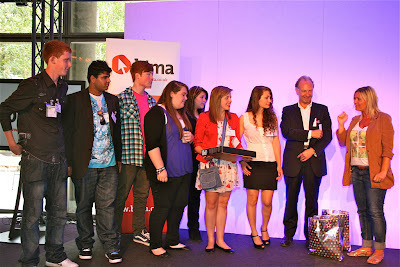 Top of my personal list though was the final of the BIMA Schools Challenge which was held at C4. Two of the schools that we mentored were in the final five - Manshead Upper in Dunstable and Aylward Academy in Edmondton. Both teams did brilliantly so huge congratulations to both of them but in particular to the team from Manshead who walked away with the Highly Commended award and presented brilliantly. Both teams have said that they'd like to continue with the project next year but we're certain they won't need much help from us this time around, in fact... it won't be long before they're after our jobs! Brilliant day, I never realised any of this was published despite looking around the BIMA website. Glad you enjoyed it Mr Devil!